Lydia’s life as a teenager is a horrible struggle. Late to develop, she feels left behind her friends and is pressured by her Mam to fit in at all costs. Things begin to develop alright when Lydia begins to change in a way that surprises everyone. Everyone that is except those who understand super powers when they see them- for good and evil. 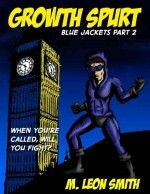 Part II of the “Blue Jackets” superhero series. Check out “Induction:BlueJackets part I” to see how it all begins.